This stamp set is perfect for summer celebrations!!! Such as the 4th of July!!! I made my card with the heat embossed ink resist method. First, I stamped the fireworks onto to some water color paper with Versamark ink. I heat embossed the images with white and gold embossing powders. Next, I watercolored around the embossed images with red and blue watercolors. As you can see, the fireworks resisted the colors! I stamped the flag and die cut it with the matching Sweet Cut. See how much fun this stamp set is going to be!!! THIS is awesome! That background really gives the feel that you are watching the grand finale of the fireworks show! Lordy be, Mackie! You are the QUEEN of techniques and this card does not disappoint! I am going to have to give this a try - your card is GORGEOUS!!!!! This is terrific, Mackie! You always have such amazing ideas! Every month i am impressed and amazed! Oh my gosh this is fantastic!!! Oh, my!!! Mackie, this card is off the charts...da bomb!! 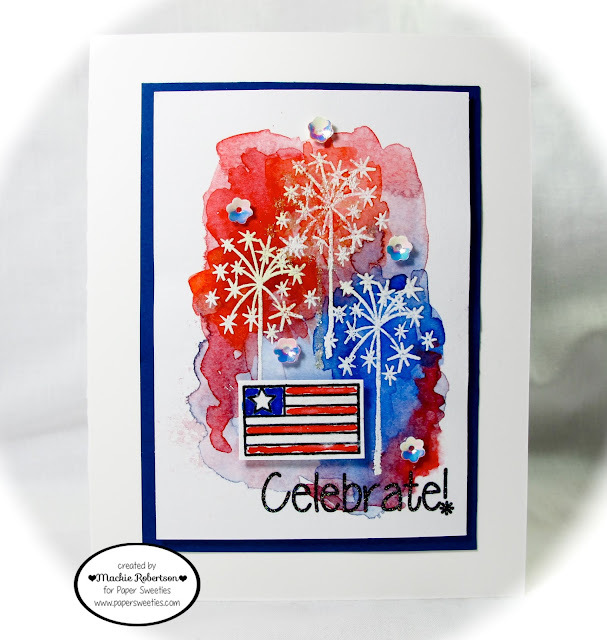 :-) Love the water colored background and fireworks...just fabulous...love it!!! 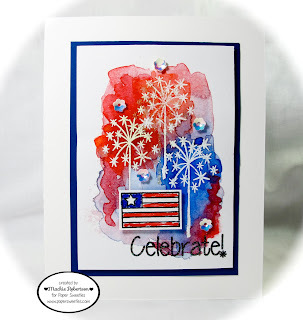 What a fabulous watercolored background to show off those embossed fireworks. Love this awesome design! Oh gosh what a fun card Mackie, well done!! Eeek! So, stinkin' fabulous! Such a happy, watercolor creation! Way to rock this release, Mackie! Wow, this is awesome, Love it, Simply striking with so many details, that are eye catching. Thanks for joining in on the fun at Tuesday Throwdown. We look forward to seeing you again. Love how the watercolors light the sky! Great technique and thanks for entering the fun at Tuesday Throwdown - watercolor challenge.